When my parents took our family on camping trips, we ate the traditional camping food like bacon and eggs, canned corn beef hash, pancakes, and hot dogs. There was little variety. I always felt fat and heavy on the camping trips. Those days are long gone. You can prepare as good of meals camping as you do at home with a little creativity. Before I get into the recipe portion of this book, let’s take a look at some very basics items that will help you prepare gourmet meals while you camp. This is not going to be the “Holy Grail” of camp cook books. 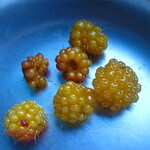 I just thought it would be a good idea to share with you the eating adventures that I have been on over the past 30 years of camping. I try to keep things very simple. If you have watched a reality show like Iron Chef, you will notice that these people are minimalists. Too many ingredients, too many pots and pans, and too many cooks will ruin a perfectly good meal. With a few high quality functional kitchen gadgets, you can prepare unbelievable food that I have pictured below. 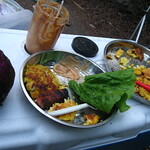 All the food pictured on this page was prepared while camping. Most of the produce was purchased from local farmers or picked by our family by foraging in the forest. 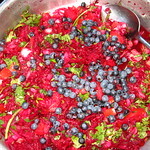 The dressing is the key to this wonderful summer salad. It’s a recipe that my wonderful wife creates with whatever fresh ingredients that we have on hand. Since my wife grew up in the Philippines, she borrowed a type of vinegar dressing that is used as a condiment on a onion and bitter melon salad that is eaten alongside fresh roasted fish. She uses an infusion of organic cold pressed olive oil, fresh squeezed lime juice, raw organic apple cider vinegar, fresh ginger, sweet red onions, raw honey, tamari soy sauce or unprocessed Redmond salt, fresh ground pepper, and some fresh cayenne pepper to give the dressing some kick. I cannot give you the exact proportions because she never makes it the same way. You will know when you find your own Sweet Spot on how you the dressing. My wife always uses what ever fresh locally grown produce that she can get her hands on. 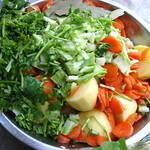 She dices the beats, onions, garlic and let’s these vegetables marinate for several hours with the fresh dressing. If we have carrots, she will grade these and add them to the salad just before serving. She also likes to great Parmesan cheese just before serving. Shredded jack, cheddar, Gouda, or any of your favorite real cheese. Heat up a high quality cast iron griddle on low-medium heat and brush it with olive oil, grape seed oil, or coconut oil. Caramelize the onion on the cast iron griddle until it tastes sweet. I often cover the onions for a few minutes to expedite the process. Briskly whisk 2 eggs. 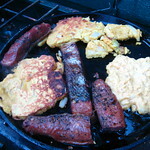 Pour the eggs evenly on to the cast iron griddle and cook until the bubble pop. Add the cheese, caramelized onions, and zucchini. Gently fold the omelet in half. Cook for approximately 1 minute. Don’t over cook. Enjoy! Some folks need a gluten free diet. I am not one of those, but my wife and son both need a gluten free diet. 1 zucchini shredded with spaghetti shredder. This is one of the easiest recipes. I found this recipe online and the directions said to bake the ingredients. Most of us campers do not have the equipment to bake. I adjusted the recipe so it can be made on a cast iron skillet. 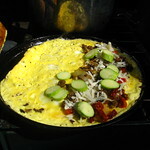 Heat up a high quality cast iron griddle on low-medium heat and brush it with olive oil, grape seed oil, or coconut oil. Turn the pancakes after the bubbles break. These pancakes taste great either hot or cold. We carry them on hikes and eat them for lunch or as a snack. Salmon is one those meals that taste good anytime of the day. Start with either fresh or fresh frozen salmon that is not farm raised. Use medium heat on the cast iron griddle. Brush the griddle with a light coating of olive oil. Cook the salmon until it’s nearly done and turn only once. My wife made over 10 pounds of organic granola before we hit the road. One batch was the made with oats and the other batch was gluten free to meet her dietary requirements. Our breakfast preparation routine was usually only a few of minutes of cutting up the fresh fruit that we picked or bought. 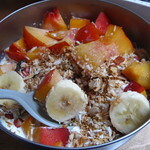 When we had fresh yogurt, we mixed it in with the granola. Having the granola topped with fresh raw organic milk was the best breakfast. I can remember eating our breakfast in the Dufur city park in Oregon with Mount Hood as the back drop. What an unforgettable experience.